Stunning condition, top spec, fixed bed, single axle 4 berth tourer for sale with every conceivable extra. Valeted, serviced and damp checked prior to sale. 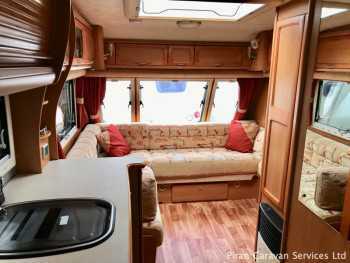 Upgraded limited edition ‘dealer special’ 4 berth tourer with fixed bed and end washroom layout. Comes with many extras and will be cleaned, and independently serviced and damp checked on arrival. 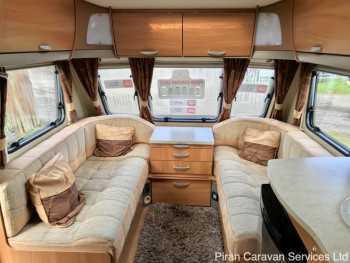 A fantastic, spacious continental 4 berth tourer with fixed island bed layout, on a manoeuvrable single axle chassis. Motor mover. Cleaned, & independently serviced and damp checked for peace of mind. 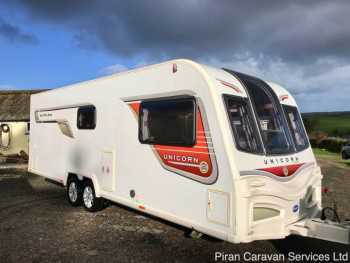 Superb 'flagship' S3 model 4 berth, twin axle Unicorn, with a fixed bed and large end washroom. Comes with many extras. Fully valeted, serviced and damp checked.. Superb flagship 2 berth touring caravan with every available extra, large lounge and opulent fittings. Comes with 2 awnings, motor mover and more. Valeted, serviced and damp checked. Swift warranty. 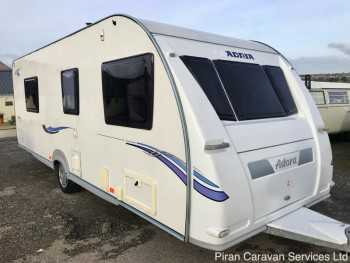 4 berth single axle tourer with desirable spacious fixed double bed layout. Cleaned, serviced and damp checked on arrival. Comes with many essential extras. 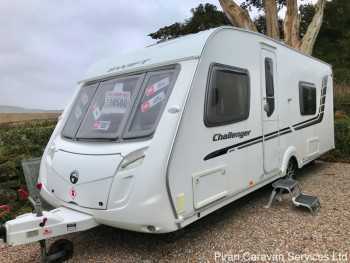 Lightweight 4-berth single axle tourer with fixed double bed, spacious U-shaped lounge and end washroom. Cleaned inside and out, serviced and damp-checked for peace of mind. 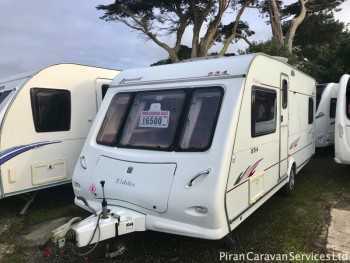 Great value 5 berth with flexible twin lounge layout and central kitchen and washroom. 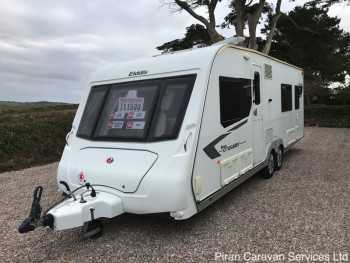 Comes with motor mover, 2 awnings and extras. Will be cleaned, serviced and damp-checked for peace of mind. 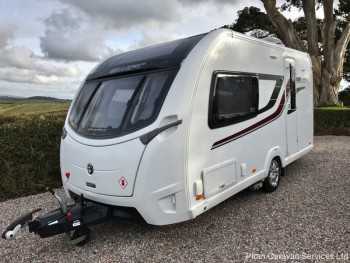 Top of the range, luxurious 4 berth, twin axle tourer with twin rear single beds and large end washroom. Comes with 2 awnings and other extras. Cleaned, serviced and damp-checked for peace of mind. A large twin axle family 5/6 berth with versatile double lounge/ rear dinette layout. Valeted, serviced and damp-checked prior to sale. Superb value at this price. A stylish high spec caravan, with fixed bed, and large end bathroom. Comes with full Isabella awning and more. Cleaned by us and fully serviced and damp checked by an independent specialist. 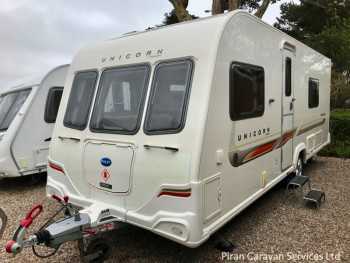 Beautiful top of the range 4 berth, twin axle Unicorn, with a fixed bed and large end washroom. Comes with awning and extras. Fully valeted, serviced and damp checked prior to sale.